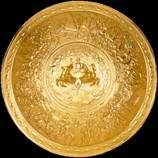 The shield given to Alexander did not survive, but from the description given by Homer, the artist John Flaxman recreated the shield in 1821. Meanwhile, silver-footed Thetis reached Hephaestus’ home. The crippled god had constructed it himself. at his command and then return to his own house. she was wife to the celebrated crippled god. “Long-robed Thetis, why visit our house now? With these words, the goddess led her inside the house. No one else knew, neither god nor mortal man. full recompense—fair-haired Thetis saved my life. But Charis, show her now our hospitality. he wiped his face, both hands, thick neck, and hairy chest. by female servants made of gold, who moved to him. hearts with intelligence, vocal chords, and strength. These women served to give their master detailed help. to our house, an honoured welcome guest? To this point, you haven’t come here often. to a mortal man, Peleus, son of Aeacus. to bear and raise as an outstanding warrior. The boy grew up as quickly as a sapling. returning home to the house of Peleus. among the Argives pleaded with my son. declining to protect them from disaster. after he’d inflicted bloody carnage. with ankle clasps, and body armour, too. when Trojans killed his loyal companion. “Cheer up. Don’t let these things afflict your heart. enduring bronze and tin, precious gold and silver. a massive hammer in one hand and in the other his tongs. attaching to it a silver carrying strap. with his great skill he fashioned many rich designs. in the assembly, for a dispute had taken place. some the other, while heralds kept the throng controlled. the staffs they’d taken from the clear-voiced heralds. who would deliver the most righteous verdict. who disagreed were arming for a secret ambush. as a defence, along with those too old to fight. large, beautiful, and armed—as is suitable for gods. They stood out above the smaller people with them. came to drink, they stopped there, covered in shining bronze. waiting to catch sight of sheep and short-horned cattle. playing their flutes and not anticipating any danger. of white-fleeced sheep, killing the herdsmen with them. and set out. They soon caught up with those attackers. while pulling the feet of one more corpse from the fight. fertile spacious farmland, which had been ploughed three times. though it was made of gold—an amazing piece of work! where harvesters were reaping corn, using sharp sickles. in sheaves with twisted straw. Three binders stood there. the poles supporting vines throughout were silver. where the grape pickers came and went at harvest time. were carrying off a crop as sweet as honey. beside a rippling river lined with waving reeds. The dogs and young men were chasing after them. and stood there barking, close by but out of reach. the men lightly rubbed with oil wore woven tunics. On their heads the girls had lovely flower garlands. testing it, to make sure that it runs smoothly. Then they would line up and run towards each other. springing, and whirling, and tumbling. the mighty river, flowing all around the outer edge. beautiful and finely worked, with a gold crest on top. Then he made him leg guards of finely hammered tin. he took it and set it there before Achilles’ mother. carrying the gleaming armour of Hephaestus.